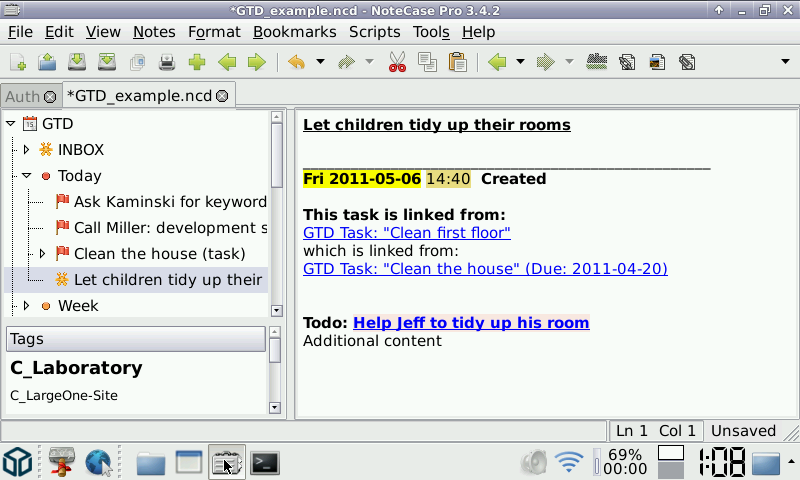 NoteCase Pro is an advanced hierarchical note manager (outliner), available for Linux, Windows and OS X. It features embedded images, attachments, audio recording, tagging, rich text, linking, encryption, a flexible search function, editable list view of only notes responsive to a search, and many other powerful features. NoteCase Pro can be extended using the embedded Lua scripting language and hundreds of APIs. This allows for feature extensions from simple scripts to complex plugins. NoteCase Pro is an advanced hierarchical note manager (outliner). Yes, all-platform license includes the Pandora. Hermocon -- thanks for the program! I've been trying out the trial version on my laptop and thinking about buying the full license that lets you us it on any platform. Does the license work on the Pandora version? Hermocom, thanks for posting this great program here.... Just installed on my new Pandora and your great GTD plugin....very cool on the Pandora! NoteCase Pro has a free mode (Lite or Trial mode, alternatively). In Lite mode, you should be able to use the old files of the free version, but not all advanced features are enabled. Trial mode allows to try all advanced features, too, but with limited outline size. Does this help you?